Today I am sharing the best Christmas sugar cookie recipe with you all! You have a melt in your mouth sugar cookies that are festive and fit into the holiday season. Soft cut out sugar cookies that require no chilling of the dough! 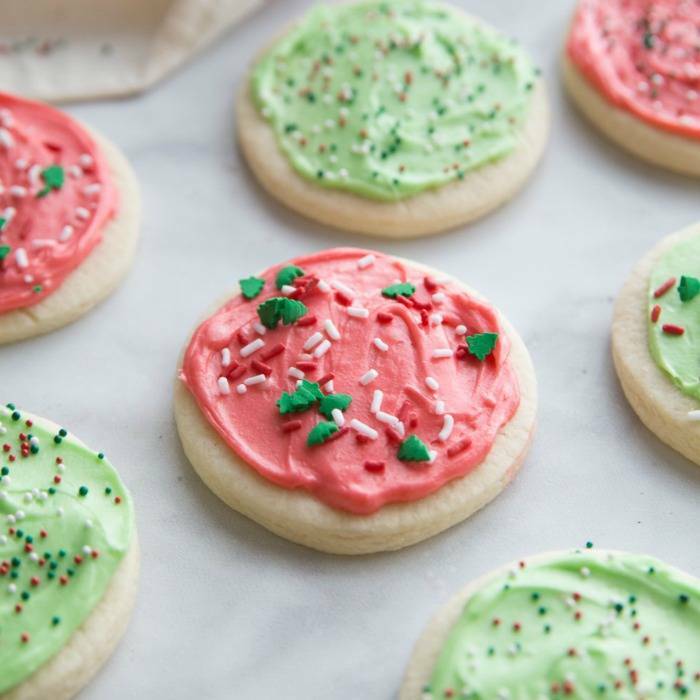 This soft sugar cookie recipe will be a perfect fit to your baking needs this holiday season. This is my tried and true sugar cookie recipe that comes out on top every single time. Add some colorful icing to decorate, sprinkle with colored sugar, or eat plain. These truly are the best sugar cookies ever. Growing up making Christmas cookies was a must every year, and sugar cookies were at the top of the list. This cut out sugar cookie recipe reminds me of the one my grandma used! Grab your favorite cookie cuts and create beautiful sugar cookies! Or if you don’t have any cookie cutters, just grab a glass or mason jar and use it to make circles for your cookies. This cut out sugar cookie recipe is tried and true, and no major steps are required. No chilling of the dough, which is a huge time saver! I absolutely love cut out sugar cookies, but I am a busy mom and wife and I don’t have time to wait for the dough to chill. I wanted to create a recipe that would save you time without cutting out the quality. Most cut out cookie recipes require you to chill the dough. You need a really cold dough to help hold the shape while using your cookie cutters but also to help the cookies hold their shape while baking. This is a recipe that doesn’t need the dough to be chilled. Just whip up the dough, roll and begin cutting out the designs you want then bake. I personally have not tossed this dough in to save for making later, but you can try it. I recommend if you do this, wrap in plastic wrap tightly and toss in the fridge until you are ready. Then allow the dough to fully come back to room temperature before you start rolling it out and using it. One of the easiest doughs to make, and you can do any shape you want. I wanted something simple and went with circles but you can do reindeer, Santas, stars, or whatever your heart desires. This frosting for the cookies is homemade and crazy simple with minimal ingredients. Feel free to add food coloring to create any color scheme you want. Allow cooling on the Cookie Sheet before removing. As you can see the recipe is straightforward and easy to make. Nothing is better than a homemade cut out sugar cookie with frosting and sprinkles. It always wins in my books! Absolutely, you can double it! Do you use salted or unsalted butter? Does the cream cheese frosting set up enough to stack cookies after drying? The consistency should be the same with either one! I used salted in the dough and unsalted in the frosting. But honestly, it’s up to you and what you have on hand. If you use salted you might notice a slightly more salty taste. I hope you you enjoy the cookies! I like that I do not have to chill the dough. However, the cookies do not have much taste. Is there something I can add to give them more flavor? Have you ever tried to use almond extract instead of vanilla extract in the cookie dough and/or the frosting? I love almond flavor. I think you either love it or you don’t. I’d try that the next time. You could swap out the vanilla extract in the cookie dough only or the frosting only to try it, or do both! Sometimes I also use half vanilla extract and half almond extract. Hope this gives you more flavor! It’s 1/4 cup of Cornstarch. Enjoy! Have you tried this with gluten-free flour? No, but if you do, feel free to come back and let us know how it tastes! Thought I’d give this recipe a try ahead of the holidays to see how it stacked up to my old-time favorite sugar cookie recipe. The taste and texture of the finished product was very good; however, the dough was very crumbly and difficult to hold together when rolling out. I wound up rolling very small amount of the dough at a time, using powdered sugar rather than flour on my rolling pin and board. The cookies that did turn out as they should (in appearance), looked very nice. All-in-all, good recipe. Just wish I knew why the dough crumbled. I was very careful when measuring ingredients, taking extra care to scoop the flour into the measuring cup using a large spoon, etc. Any tips from someone who has made these before would be most welcome! Will the frosting set hard? You’d have to let it dry for a day or so but you could stack them, but it isn’t a hard icing like a royal icing. On the frosting recipe it says to add the remaining butter to it. I’m assuming it’s the butter from the cookie dough. So how much do I add to the cookie dough and then to the frosting? The recipe has been updated to clarify this. Thank you for the note. You’ll use 1 cup of softened butter for the cookie dough and 4 tbsp. of unsalted butter for the frosting.